DOHA, Qatar: PRNewswire: Nine inventors from across the Arab world earned the chance of a lifetime yesterday, vaulting ahead of their fellow applicants to earn a place on the Qatar Foundation flagship media initiative Stars of Science this season. 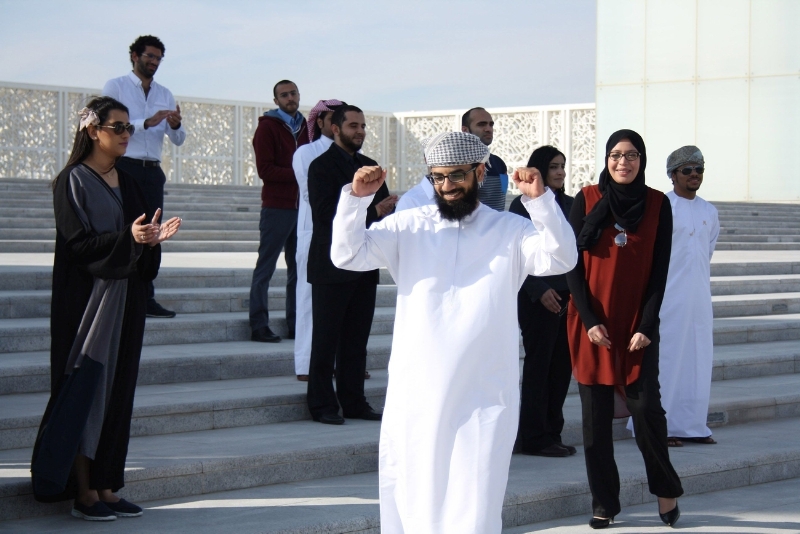 Viewers watched as the story unfolded on the Majlis episode, where 19 shortlisted innovators from the first three episodes waited nervously to see if their journey would continue to the next stage of the contest. The nine candidates, each hailing from a different country in the region, follow in the footsteps of over 100 Stars of Science alumni. Racing against the clock and competing against each other, all nine candidates will prepare to face the jury once again at the prototyping stage. The jury members will only select six out of nine projects to move on to the customer validation stage. As the show progresses, two other candidates will be eliminated, leaving four finalists who will earn a share of a $600,000 prize based on jury and public voting. Candidates on this year’s Stars of Science will develop projects that aim to solve problems in several sectors vital to region and the world – health, energy, and environment and information technology. This feeds into Qatar Foundation’s objective of encouraging the next generation of science and technology innovators while encouraging the development of impactful inventions on the show. Joining the show over the next few episodes to support the candidates will be Stars of Science alumni Amina Al Hawaj, Majed Lababidi andMohamed Watfa. In the next episodes, audiences will witness candidates develop their prototypes with the guidance of mentors specializing in engineering and design and alumni support. Each group of candidates will work from their new professional home in Qatar Science & Technology Park, where they develop bonds of friendship and rivalry as they spend weeks tinkering with their prototypes in close quarters. Viewers witness candidates’ triumph and frustration as they prepare to face the jury in groups of three. Each of the next three Stars of Science episodes will give an in-depth look at a group of three candidates. One candidate from each group will be eliminated by the jury at the culmination of the episode, leaving six candidates standing going into the customer validation stage. Audiences will witness candidates develop their prototypes with the guidance of mentors specializing in engineering and design and alumni support. Next Saturday’s episode contains determined and talented candidates whose inventions fall into the health and information technology spheres. Ghassan Yusuf, a 33-year-old fromBahrain, will work on a prototype of an automatic scoring system for Taekwondo matches. Jordanian cytogeneticist Sadeem Qdaisat, 29, aims to save lives with a machine that streamlines the process of genetic testing. Nizar Chelly, a 32-year-old Tunisian doctoral student, will develop a phone robotic platform auto scanner. On October 22nd viewers will meet 22-year-old Ali Al-Sulaiti of Qatar, who will take on Egyptian Ahmed El Khatat, 34, and Algerian Abderrahim Bourouis, 29. The Qatari’s innovation is a drawing generator that turns 2D drawings into 3D animations. Al Khatat, a university professor, aims to make it to the next round with a shower especially designed to preserve the independence and privacy of elderly users. Bourouis wants to impress the jury with a smart shirt designed to monitor and soothe children with autism spectrum disorder. In the final prototyping episode airing October 28th, twenty eight year old Syrian Yazi Alalowill be presenting an innovation that monitors the freshness and safety of food. Challenging her is Omani Saif Al Farai, 24, and Lebanese engineer Sevag Babikan, 27. Saif, a mechatronics graduate, will work on a device designed to convert Arabic text to braille instantly. Sevag will try to revolutionize the 3D printing world with his printer invention, which he says will make current models obsolete. Host Khaled Al Jumaily will guide audiences in the coming episodes, which will air onOctober 15th at 10:30 PM KSA (7:30 PM GMT) on MBC4. Applications for Season 9 are now open for Arab nationals between the ages of 18-35. Please visit starsofscience.com for more details. Stars of Science, the flagship “edutainment reality” TV format initiated by Qatar Foundation, is the Arab world’s leading innovation show that enables the region’s aspiring science and technology entrepreneurs. In this eighth season, nine candidates are challenged to develop creative solutions to regional problems within the fields of information technology, energy, environment, and health. An expert panel of jurors assesses and eliminates candidates and their innovative products in Prototyping and Customer Validation episodes until only four remain. These four finalists vie for a share of $600,000 in seed funding, determined by a jury deliberation and online voting from the public. Stars of Science airs every Saturday on MBC4 at 10:30pm KSA / 7:30 pm GMTstarting September 17th till November 19th 2016. Qatar Foundation for Education, Science, and Community Development (QF) is a private, non-profit organization that is supporting Qatar on its journey from a carbon economy to knowledge economy by unlocking human potential, for the benefit of not only Qatar, but the world. Founded in 1995 by His Highness Sheikh Hamad bin Khalifa Al Thani, the Father Emir, QF is chaired by Her Highness Sheikha Moza bint Nasser. QF’s work encompasses education, research and community development. World-class universities are brought to Qatar to help create an education sector in which young people can develop the attitudes and skills required for a knowledge economy. At the same time, QF builds Qatar’s innovation and technology capacity by developing and commercializing solutions through key sciences. The Foundation also works to foster a progressive society while enhancing cultural life, protecting Qatar’s heritage and addressing immediate social needs in the community. MBC Group (Middle East Broadcasting Center) is the largest and leading private media company in the Middle East & North Africa region. For the past 25 years, MBC Group was able to enrich people’s lives through information, interaction and entertainment. In 2002, nearly a decade after the launch of MBC1 in London, back in 1991, and as the 1st private free-to-air Arab satellite TV channel, MBC Group moved its headquarters to Dubai Media City, United Arab Emirates, where it remains. Today, MBC Group includes 20 TV channels: MBC1 (general family entertainment); MBC2and MBC MAX (24-hour western movies); MBC3 (children’s edutainment with a mix of both local productions and western acquisitions); MBC4 (entertainment for young families with a female-focus); MBC Action (an indigenous adrenaline-packed channel targeting young males with local and homegrown productions); MBC Variety (Western films and general entertainment with uninterrupted broadcasting); Al Arabiya News Channel (the 24-hour Arabic language news channel); Al Hadath (an extension of Al Arabiya News Channel with a specific focus on real events in the Arab world and beyond); Wanasah(24-hour Arabic music channel); MBC DRAMA (24/7 Arabic drama); MBC MASR (general family entertainment geared towards the Egyptian family); MBC MASR 2 (providing the Egyptian audience with superior quality entertainment); MBC + Drama (exclusive on MyHD); MBC Bollywood (delivering the freshest in Bollywood content geared towards the region via an Arabized interface); and most recently four sports channels, MBC PRO SPORTS (geared towards the “Saudi Football Premier League” fans in the Kingdom); andMBC USA (the channel is present on “Dish Network” in the US, and targets Arab audiences aboard; the channel is dedicated to offer and broadcast a wide range of content from the prominent MBC channels including movies, series and global formats). In July 2011, seven channels within MBC Group began to broadcast in HD across the MENA Region: MBC1 HD, MBC2 HD, MBC4 HD, MBC Action HD, MBC Drama HD, MBC Max HD and Al Arabiya HD. In 2013, MBC3 HD joined the collection of HD channels followed by MBC Variety HD in 2014. MBC Group also includes two FM radio stations: MBC FM (Gulf music) and Panorama FM(contemporary Arabic hit music); as well as O3 Productions, a premium content drama production company. Furthermore, MBC Group includes online platforms: mbc.net, alarabiya.net, shahid.net (the first free VOD and catch-up portal in the Arab world) and actionha.net, and mbcprosports.net among others.